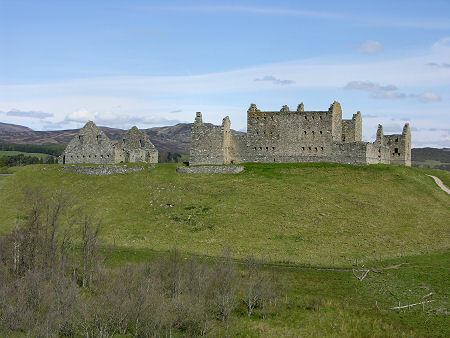 The impressive and nicely proportioned mound on which Ruthven Barracks stands is said to be a natural leftover of the retreat of the glaciers at the end of the last ice age. Its regularity suggests that man has taken a hand as well. The mound overlooks the site of an ancient ford and ferry between it and today's Kingussie. This was one of the few crossing places of the middle reaches of the River Spey before it was bridged near Newtonmore in 1808, and it lies at an important junction of the routes through the Cairngorms. 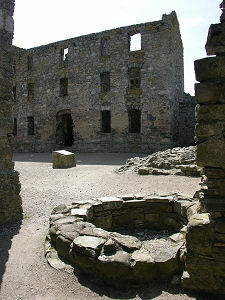 The first recorded castle to be built here appeared in 1229. 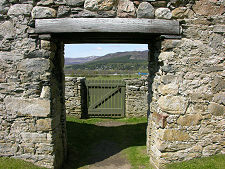 By 1371 it formed the centre of activity of Alexander Stewart, Lord of Badenoch, and younger son of Robert II. More popularly known as the Wolf of Badenoch, Stewart is mainly remembered for falling out with the Bishop of Elgin and being excommunicated by him for marital infidelity. 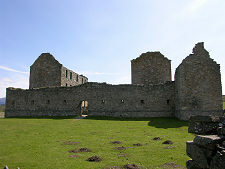 In retaliation he destroyed Elgin Cathedral, and much of Elgin, in 1390. 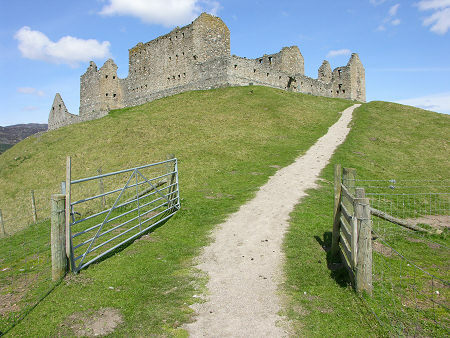 This first castle was destroyed in 1451, then rebuilt by 1459 as a much grander fortification. 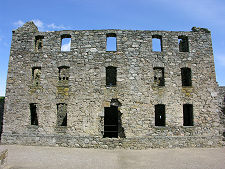 It was fought over during the Civil Wars, then badly damaged by Viscount Dundee, Bonnie Dundee and the Jacobites during the first uprising in 1689. 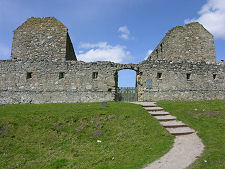 After the 1715 Jacobite uprising, the Government decided to tighten its grip on the Highlands by building four fortified barracks in strategic locations. 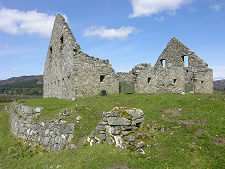 Ruthven Barracks was one of them (another was Bernera Barracks in Glenelg), and all remains of the earlier castle were removed to make way for the structure you see today. The barracks took much longer to build than planned, and was finally completed in 1721 (see our Historical Timeline). 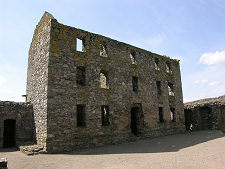 The barracks were designed to house 120 troops, split between the two barrack blocks. Officers lived separately. 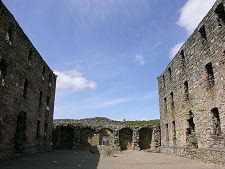 The stables, standing slightly to the west of the rest of the barracks, were built in 1734 to house 28 horses for dragoons. By this time its strategic importance had been enhanced by the building of General Wade's military roads from Perth, Fort Augustus and Inverness that came together here. And, if it's really quiet, and getting dark, watch out for ghostly chess-players. 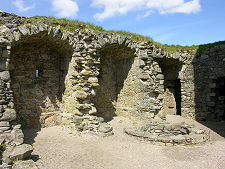 It is said that one evening in July 1394 a visitor dressed all in black arrived at Ruthven Castle and challenged Alexander Stewart, the Wolf of Badenoch to a game of chess. 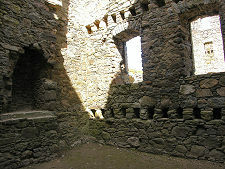 By morning, no-one was left alive in the castle: for such are the perils of playing chess with the Devil.